Rajnandgaon: A video showing the family members of a dead woman taking her body out of a government hospital on a push-cart at Rajnandgaon in Chhattisgarh triggered a minor controversy. The hospital authorities said that they had asked the family members to wait only till they could arrange a hearse. Following the incident which took place yesterday, Chief Minister Raman Singh directed the administration to review the facilities at the government-run Medical College Hospital (MCH) at Rajnandgaon. Khileshwari Sahu (20), resident of Bakhrutola village in the district, was brought to the hospital on July 1 with severe burns. She died during treatment. When her family sought a hearse, officials asked them to wait as the two hearses with the hospital were out. Meanwhile, some Congress workers reached the hospital and shouted slogans against the administration. Hospital superintendent Pradip Beg said the family members had been asked to wait as the hospital was arranging a vehicle. By the time a hearse was sent, they had left the hospital with the body on a push-cart and then arranged a private ambulance outside, he said. 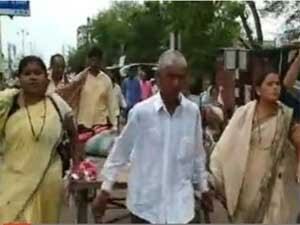 A video of Congress workers pushing the cart with the woman’s body on it did rounds on social media today. An official statement released today said that Chief Minister Raman Singh had taken a serious note of the incident and directed the administration to review the facilities at the Medical College Hospital. Under the state’s Muktanjali scheme, sixty hearses have been given to government hospitals, the statement said. Rajnandgaon collector Bheem Singh had ordered the sub-divisional magistrate Atul Vishwakarma to investigate the incident, and appointed a deputy collector to monitor the quality of services provided at the hospital, it said.